1. Use them to group students - either by number, color, or symbol, depending on how many groups you need. 2. Have students play Go Fish. 3. Have students in small groups draw a card, and the other students try to guess what number is on it. The student with the card can indicate if they need to go higher or lower (for practicing numbers up to 10). 4. Have students in small groups draw two cards, and the other students try to guess the sum of the two numbers (for practicing numbers up to 20) or the product (for numbers up to 100). 5. Play talking cards. I used the idea from El mundo de Birch, and made my own in French. 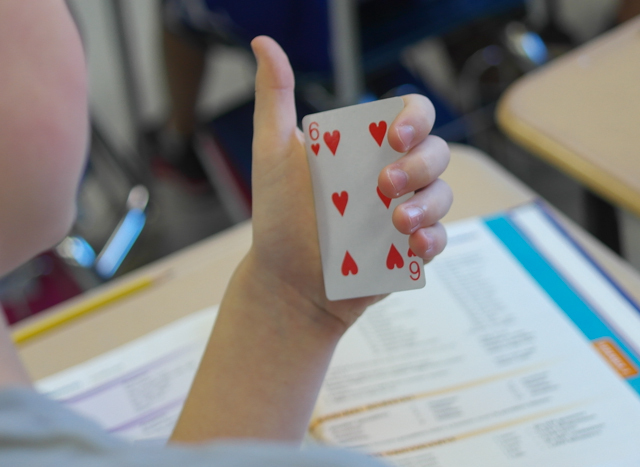 Have you ever used playing cards in your lessons? If so, how?